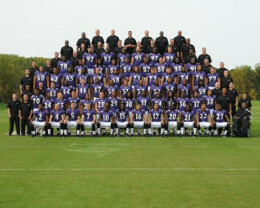 Keep Humble, Stay Positive … GO RAVENS! Posted by sportsupdatebyconciergewill in Baltimore, EAT. PLAY. LIVE., Family Fun, Leisure, Lifestyle, NFL, Super Bowl XLVII, Tickets - Sports & Recreation, Work. Life. Balance. The Ravens will face off against the Patriots at 6:30 pm Sunday, which is the prime-time game as well. This game for the Ravens will either be a send off for Ray Lewis or a prelude to an upcoming Super Bowl visit 2 weeks later. However there is something I want to get across: stay calm, stay humble, and find your center. With how well matched this game is appearing, this game could almost be a coin flip to decide the winner. Speaking of which, we may get a coin flip for a possible overtime that may end up deciding the winner. The point, however, is to not overreact to a worst case scenario. I have faith in the Ravens this week and I can see our offensive line pushing the Patriots’ defense on their backs as we dominate them. However, I know an end to our season could still happen, as I had that fear last week as well. Now, on Friday I attended an M&T Bank sponsored Ravens Pep Rally. The crowd was pretty excited with both the atmosphere and the upcoming game as well. The MC’ing was done by Gerry Sandusky (not Jerry), former Ravens wide receiver Qadry Ismail, and former Ravens kicker Matt Stover. The two players were big factors in the Ravens’ 2000 Super Bowl run. Everyone around me was in a great mood. You had cheerleaders handing out both raffle tickets and autographed pictures. There was the marching band down below playing fantastically. Poe came by and was quite photogenic in his pictures, along with complete strangers very happy to take pictures for others. Free shirts came and went in a blink of an eye (well more like four minutes) as well as pom poms. Gerry, Matt, and Qadry were very engaging with the crowd, one point asking the people if they wanted to share their superstitions during Ravens games. Also, those raffle tickets yielded winners for footballs autographed by Haloti Ngata and a Ray Lewis poster signed by Ray himself. Yes, everyone was full of excitement, even the random Steelers fan and Cowboys fan that appeared. However, if we don’t win Sunday, the people who are the most confident & cocky now will feel the most depressed Monday morning. This is true with all sports teams and the people who so strongly believe in a certain team’s success and then watch those teams crumble. While our favorite players are labeling the Ravens as the “Team of Destiny” in winning the Super Bowl for Ray Lewis, don’t you think players on other teams thought the same with their teams? Take for instance the Denver Broncos, who so well believed that they would be facing Brady before heading to the Super Bowl; you could see the visible gasps and dropped jaws in the stadium when Tucker made that winning kick for us. Fans had shirts all ready to go for another Brady-Manning match-up. Peyton Manning walked right into the locker room, refusing to talk to reporters. I remember how unconvinced people were in our area, including myself, that we could beat the Patriots like we did in the 2009 season’s playoffs. Also, I do recall how cocky and arrogant people in our area, including myself again, were last year in how we assumed we would totally win against the Patriots. So now we come to this rematch game a year later and, while I see more and more Ravens gear & supporters every year, there is less arrogance than last year but not outright disbelief in our team’s chances. A majority of the fans are stuck in the middle, saying that they’re pretty sure we will win along with hoping we will win this for Ray. This is a good attitude to have, even if its not good for pre-game TV build up. You must think about your own well being as well, and not get too upset or ecstatic over just a game with artificial bearing on the nation. I hope I don’t sound like too much of a downer. I do like the Ravens’ chances in this game. If you have seen the injury reports, you would know that the Patriots are down their best tight end. Last time we played them, back in week 3, their second best tight end was out and we won by 1 point. Back in January of 2010, they were missing their best wide receiver Wes Welker and we won that game 33-14. However, last year they weren’t missing their main offensive components and we lost by 3 points. What I am most excited about is another dueling match-up between Tom Brady and Joe Flacco, and Flacco has outperformed Brady each time, despite facing more of a pass rush. This time around, the Ravens have a successful O-line that has allowed only 2 sacks and few QB hits against two of the best pass rushing teams. He should feel more comfortable this time around against a Patriots defense that does not have such comparable pass rushers, nor do they have their defensive hero (Sterling Moore) from last year’s AFC Conference Championship, as they cut him early in this season. While once again the focus will be on Ray Lewis’ pending retirement and Brady hoping to get a 4th Super Bowl ring, what will be ignored is Flacco lighting up the Patriot defense and Ray Rice doing his touchdown celebration. Enjoy your weekend and go Ravens!